Arena Financing $70.5 million public money, remainder by the teams. Naming Rights Staples, Inc. paid $100,000,000 for 20 years. 1992-1999 - Attendance at The Los Angeles Sports Arena. Los Angeles city officials want the owners of the Los Angeles Kings to develop a $240 million, 20,000 seat sports and entertainment complex near the downtown Los Angeles Convention Center. The arena could also be used by the Los Angeles Lakers, which currently share the Great Western Forum in Inglewood with the Kings. Lakers owner Jerry Buss has said he would follow the Kings to a downtown facility, but he would prefer to have a new arena built in Inglewood, 15 miles southwest of downtown. August 9, 1996. Edward Roski, an owner of the NHL's Los Angeles Kings, has signed a formal proposal to build a $240 million sports arena near the downtown convention center if the city agrees to a financing plan. 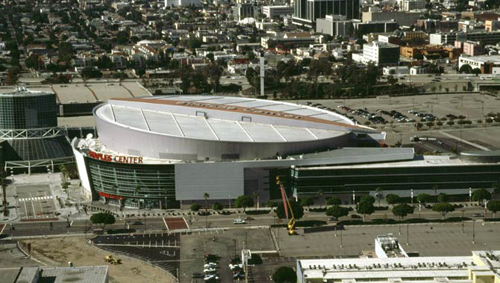 The arena would house the Kings and Lakers beginning in 1999-2000. August 16, 1996. Los Angeles officials have signed a letter endorsing a formal proposal by the owners of the Los Angeles Kings to build a $240 million sports arena by 1999. Edward Roski, an owner of the Kings, signed the formal proposal to build the arena near the downtown convention center on August 16, 1996 - provided the city agrees to a financing plan. August 20, 1996. The planned arena would be developed and owned by the Los Angeles Kings, a hockey franchise and shared by the Lakers. Though the facility could cost more than $200 million, the payoff is expected to be substantial. August 22, 1996 - The Lakers now play in the Great Western Forum, which was built in 1967 and is one of the oldest arena's now used in pro basketball. It has 17,505 seats, compared with 20,000 planned for the new arena. More important, the Forum has no skyboxes or other corporate suites, which can sell for as much as $60,000 a season, or room for the clubs, restaurants and retail stores that accessorize modern arenas. April 18, 1998 - The Los Angeles Clippers will share the new Staples Center with the Lakers and Kings, making the downtown facility the first to host three professional sports teams. The Clippers Friday agreed to a six-year lease to play in the $300 million Staples Center in downtown Los Angeles when it opens in the fall of 1999. The Clippers' NBA brethren, the Lakers, and the NHL Kings previously announced plans to play in the Staples Center and leave the Great Western Forum, where they have played since 1967. In addition, The Fox Group, which spent $311 million to buy the baseball Dodgers, announced it has entered into a partnership with the L.A. Arena Company that grants Fox a minority interest in the Staples Center development. The L.A. Arena Company operates the Staples Center and is co-owned by the Anschutz Corporation and Edward P. Roski Jr., who also own the Kings. The agreement calls for the Fox Group and the L.A. Arena Company to be partners in a proposed entertainment complex to be built at a later date near the arena. The partnership gives Fox and option to acquire a minority share in the Kings, subject to approval of the NHL. In addition, Fox signed a letter of intent to participate, along with Philip F. Anschutz, in the acquisition of a minority stake in the Lakers, subject to NBA approval. "Although it will take the most creating scheduling ever, the extraordinary and technically advanced features of our building will give us the ability to provide this unique gift to Los Angeles sports fans," said L.A. Arena executive vice president Timothy L. Leiweke. "We had many discussions with regards to scheduling with both the NBA and NHL, and they are quite comfortable with our plan for Staples Center to simultaneously host the three teams." The Clippers previously turned down a deal to move all of their home games to the Arrowhead Pond in Anaheim, where they will have played eight home games this season. The Clippers play the rest of their games at the antiquated Los Angeles Sports Arena, the oldest current facility in the NBA. Details of the partnership were not disclosed, but the Los Angeles Times reported that the Fox Group will acquire a 40 percent stake in the new arena, which would be a victory for Fox in its ongoing corporate battle with the Walt Disney Company, which owns the Arrowhead Pond. Friday's decision puts one of the more successful franchises in NBA history, the Lakers, in the same building with one of the worst in the Clippers. The Clippers have made the NBA playoffs just three times since moving to Los Angeles in 1984. "The unique partnership formed here Friday is sure to produce a world-class environment for our fans and our entire organization and will provide a solid foundation for improving our franchise," said Clippers executive vice president Andy Roeser. The agreement also calls for the formation of a Board of Directors to oversee all aspects of the L.A. Arena Company. Board members will include several Fox executives. The Staples Center is being built with private financing and will seat 20,000 people for basketball and 19,000 for hockey. It will include 160 luxury suites, two restaurants and private clubs. March 8, 1999 (AP) - A fire devoured stacks of roofing insulation atop the unfinished Staples Cente in Los Angeles, but damage was considered minor and there should be no delays in the scheduled October opening of the new home for basketball's Lakers and Clippers and hockey's Kings. The blaze was attributed to an electrical problem. The $375 million Staples Center in Los Angeles is ready for a Hollywood-style premiere Sunday with a concert by Bruce Springsteen. The venue was constructed in a record 18 months and is already setting records. The venue set a new record for naming rights in a $100 million deal with office-supplier Staples and it is the only venue to host two NBA teams and one NHL team. The NHL Kings will call the arena home while the Lakers and Clippers of the NBA will work the venue's new boards. The venue has also landed the 2000 Democratic National Convention and the Emmy Awards telecast. The Arena Football League's Avengers will debut in the venue next year. The 900,000 square foot building seats 20,000 for basketball and 19,000 for hockey. It has 22 concession stands over 5 concourses, an eight_sided video scoreboard and a 20,000 square foot plaza entrance with a large, digital screen to greet visitors. Suites are arranged in three levels in the center of the bowl. A private restaurant, the Premier Club, will be available to members only. The club will only take 200 members and they pay $10,500 annually for the privilege. The club will also have access to a private wine cellar and humidors. Another upscale restaurant, The Arena Club, will seat 500 and will feature menus and prices to match the city's top restaurants. Food will be prepared by a renowned chef. Only suite holders and club seat holders will be allowed to make reservations. A separate sports bar and restaurant will be open to the public. Levy Restaurants, the suite concessionaire, plans themed menus, grilled specialties along with Asian and Italian offerings in its service to club seat and suite customers. The 160 suites lease for $197,500 to $307,500. For 2,500 club seaters, in_seat service will be available. The center was designed by NBBJ Sports and Entertainment. The building will also have retail and team office space. The spoils aren't only for the affluent. Pacific Bell is sponsoring a service that will have an attendant bring a wireless phone to your seat if a call comes in for you. The caller must only know your seat number. The venue was built by Kings owners Edward Roski Jr. and Philip Anschutz. Rupert Murdoch's Fox broadcasting group has purchased a 40% stake in the building along with an option to buy a 40% share of the NHL Kings. The company will also join the L.A. Arena Company in a proposed entertainment district to be built on a 28_acre site around the new venue. Anschutz and Fox also have signed a letter of intent to buy a 25% interest in the NBA Lakers owned by Jerry Buss. Construction and operations were overseen by Tim Leiweke, president of the arena, Kings and MLS Galaxy. Leiweke also helped launch the Pepsi Center project in Denver and the Target Center in Minneapolis. The arena comes after Roski and Anschutz guaranteed not only their part of the bargain, but that repayment of the city's municipal bonds won't come out of property or sales taxes. They will also pay for use of the land. Both the Kings and the Lakers signed 25_year leases for the arena. The Clippers have a six year lease. The city is investing a total of $70 million. The center is expected to draw more than 3 million visitors a year and host more than 230 events a year. Developers also hope to attract all_star games, tournaments, concerts and award presentations. Even officials at Arrowhead Pond in Orange County aren't sad to see the arena open. Officials there say there's plenty of business for two arenas and that Los Angeles and Orange County are really two separate markets. They point out that the in-demand Ricky Martin is playing both the Pond and the Staples Center in November and Bette Midler is doing the same in December. On New Years Eve, the Staples Center will feature the Eagles while at the Pond, it's Disney on Ice. Overall the Pond expects to host 200 events a year. December 6, 2007 - The Staples Center - our experience here evokes some of our best.. and worst stories, as we shall explain. This facility was built at a cost of over $400 million, and no expense was spared into making this arena a place with zest and pizzazz, a typical showcase for the world's entertainment capital. The arena is built in the downtown core, and with it comes hope for a rebirth of the area by designating a 30 acre "entertainment zone", anchored by the Staples Center and the adjacent convention center. We arrived via the light rail line, which deposited us about a block away, and we found surface lots around the arena in abundance. Some of the adjoining neighborhood looked pretty seedy, but the potential is there, and once you arrive at the building itself, you are overwhelmed at its sheer size and imposing architecture. Step inside, and you are immersed in a sweeping lobby with glass rising to the ceiling and gigantic video boards, sculptures, plants and glass lined escalators to take you upstairs. Bright, roomy, and high tech advertising boards, impressively designed kiosks, concession stands and vending carts everywhere. The Team LA merchandise store and the FOX sports cafe are off the main concourse. The upper concourses have outdoor balconies, where fans can step up to an outdoor bar, order a drink and enjoy the warm California weather. Pretty big and imposing, the levels are broken down into 100 level, 200 level with Premier Seating, THREE levels of suites, and then the 300 level way way up high. In the end zone above the 200 level is a restaurant for Premier Seat holders with a view of the playing surface. An 8 sided scoreboard hangs in the center, and among the many ad panels and message boards are three out of town scrolling scores - one for NHL, one for NBA, and the third for NCAA. Pretty cool! Great selection at boxcar prices, but somebody has to pay for all this! Best of show here is the mexican stand - with the fajitas and the nachos grande. The Los Angeles Lakers have had the greatest success here, with their six NBA championships. Their retired numbers include the names Chamberlain, Jabbar, West, Baylor, Johnson, Goodrich and Worthy. The Kings have hung the names of Rogie Vachon and Marcel Dionne. The Clippers???? movin on..
We walk in the building for the Lakers game, and start snapping photos. Immediately we are confronted by a security guard (skinny kid, about 19 years old, 120 lbs impeccably dressed) who insists that we turn over our camera. When we balked, he "escorted" us to guest relations, leading Andrew by the arm until Andrew told him that he was perfectly able bodied and did not require assistance. We were forced to surrender the camera, even though we identified ourselves as visitors, told them about our project and pleaded with them to take even one inside photo. Nothing doing. It doesn't end there... ushers, vendors, security people and concession workers all had this mean and surly attitude about them. Maybe it's a SOCAL thing, but we were treated very shabbily. And no, there is no inside photo on this profile, because we had no camera. Amazing building, lots to see and do, and we are hoping that our Clippers experience in 2001 will make up for the rough time we had with the Lakers and the Kings. We will sneak in the camera, and post an update, hopefully with a lot of cool pics! The road trippers venue profile is pretty much covered in our first Staples Center report, so basically we want to share a little bit about our return visit, this time to see the Los Angeles Clippers play. The Clippers have a tie to our home in Buffalo, New York, since this franchise was born as the Buffalo Braves back in 1970. The Braves thrilled and dazzled us during their time in Buffalo, and great players such as Randy Smith, Ernie DiGregorio and Hall of Famer Bob McAdoo led this team to heights that have never been achieved since they left Buffalo. The City of Buffalo never embraced the Braves, and once the team was sold, new owner John Y. Brown went through a series of deals and maneuvers which landed the team in San Diego, where they became the Clippers. Well, the team did even worse there, and a few years later they moved to Los Angeles, where they became the Los Angeles Clippers. This franchise never had too much success, and even today is regarded as the poor cousin of L.A.'s glitzy team - the Lakers. Nevertheless, this team does have its following here in Los Angeles, and finally are showing signs of life on the court. Now they are really a fun team to watch, and have a stable of young talent which bodes well for their future if they can keep these guys together. Our assessment of the Clippers is similar to that of the '95-'96 Sabres, who weren't playoff bound but hard working and entertaining. Judging from the sellout crowd on hand and on their feet cheering a Clippers win, this team is clearly winning the hearts of the fans. A sellout crowd! A franchise record 10th sellout! What is going on here? The Clippers actually are selling out games to folks who want to see THEM play! On this night, the Clippers pretty much manhandled the playoff bound Timberwolves. Best quote of the night was from Clippers forward Eric Piatkowski, who gleefully said "we don't want this season to end!" Staples Center gets a high rating,, but that distinction is made on behalf of the Los Angeles Clippers. We tip our hat to the folks who once called themselves the Buffalo Braves, and we recommend that when you visit the Staples Center, you skip the Lakers, you skip the Kings, and buy tickets to the Clippers. You will save a lot of money on your tickets, and the Clippers people will treat you right. Eight luxury suites on the top level of the Staples Center in Los Angeles will be converted to a new Hyde Lounge, a spinoff of the nightclub with the same name that operates a few miles from the arena. The goal is to sell memberships to the club. Los Angeles, Calif. - Staples Inc. has converted its 20-year naming rights deal for the downtown Los Angeles arena into a lifetime agreement. Terms of the deal with venue owner AEG were not announced. The deal is the first lifetime naming rights deal for a major-market arena. The original Staples Center deal was also the first to reach $100 million. 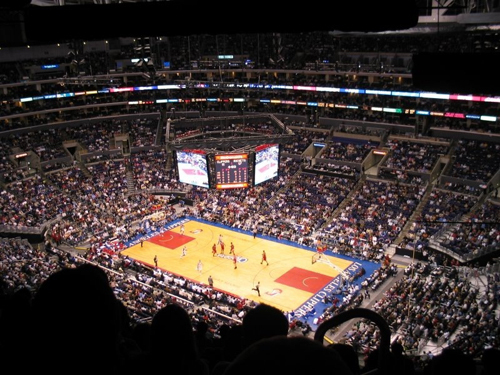 Staples has owned the naming rights to STAPLES Center since the arena`s opening in October 1999 as part of the company`s original agreement with AEG. The 10th year of this agreement included an option for a naming rights extension. "Staples has been a great partner since day one," said Timothy J. Leiweke, president & CEO of AEG and STAPLES Center. "They had the vision to enter into a groundbreaking agreement 10 years ago, which has certainly paid off with a partnership to create an association with the most widely recognized venue in the world. This lifetime deal, with a leading global brand, will continue to be heralded as a great investment and one that will help secure the future of STAPLES Center as a world-class sports and entertainment destination." With annual attendance of more than four million people and about 250 events annually, the Staples Center is the host of many high-profile events of national and international distinction. These include the 2000 Democratic National Convention, the 2002 NHL All-Star game, the 2004 NBA All-Star Game, 2009 ISU World Figure Skating Championships, nine GRAMMY Awards shows, the ESPN X Games, the WTA Tour Championships, and is home to the NCAA Men`s Pacific Life Pac 10 Basketball Championships. Most recently, the arena received global attention for the Michael Jackson memorial service which was watched by over 2 billion viewers worldwide. 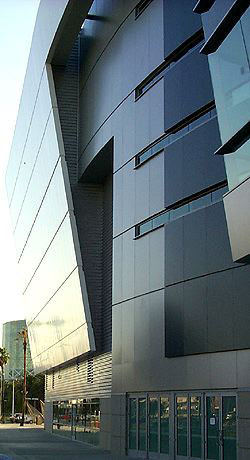 Los Angeles, Calif. - Officials at the Staples Center say all 150 luxury suites at the building are now leased. The suites were not fully leased last year. The price of VIP entertainment is not cheap - boxes that hold as many as 14 people cost between $250,000 and $475,000 a year, depending on their location in the downtown Los Angeles arena. For that, owners get about 2,500 tickets a year to every public event held at Staples. Those include Los Angeles Lakers, Clippers and Sparks basketball games and Los Angeles Kings hockey games, along with concerts, lectures, the X games and the occasional wrestling match. The boxes didn't sell out in 2009, AEG spokesman Michael Roth said, but they did for 2010. A few of the boxes are held by individuals, but most are rented by companies that use them to entertain clients. Los Angeles, Calif. - AEG has launched AEG 1EARTH, a program designed to reduce and track the energy used by the properties it owns and manages, the company said. * 20 percent reduction in greenhouse gas emissions (CO2 intensity). * 15 percent of all electricity usage derived from renewable energy sources. * 25 percent of all solid waste diverted from landfill. * 20 percent reduction in water use intensity. The AEG report contains metrics, collected from 20 facilities from within AEG's global network of venues, including STAPLES Center, Nokia Theatre L.A. LIVE, The Home Depot Center and Ontario's Citizens Business Bank Arena. New York - Bonds issued to help build the Staples Center in Los Angeles, the Pepsi Center in Denver and offerings from the NBA have been placed on Fitch Ratings' Rating Watch Negative list because of the possible loss of the upcoming season, the company reported. The move is advisory and does not reduce the bonds' existing rating. "Fitch Ratings has placed the 'BBB+' rating on the NBA's $957 million league-wide revolving facility borrowings (privately placed through its affiliate Basketball Funding, LLC) and the 'BBB+' rating on the NBA's $1.34 billion senior notes (various issues due through 2020; privately placed through its affiliate Hardwood Funding, LLC) on Rating Watch Negative. "Additionally, Fitch is also placing the 'BBB+' rating on the L.A. Arena Funding LLC's (Staples Center) $234 million arena-revenue backed bonds and the 'BBB-' rating on the Denver Arena Trust's (Pepsi Center) $46.7 million revenue-backed bonds on Rating Watch Negative. Fitch has also placed private ratings on approximately $500 million of arena revenue-backed bonds with an NBA anchor tenant on Rating Watch Negative," the company said. The company said there are a number of potential outcomes that could lead to further action. "If a new agreement cannot be met, Fitch will closely monitor future negotiating sessions to determine additional rating actions," it said in a statement. "While Fitch notes that sports industry labor agreements have historically been agreed upon in the final hours of negotiations while avoiding a delay in the season or missed games, it is Fitch's opinion that recent negotiations have lacked momentum to reach an equitable agreement in the near term in order to start the regular season on time." The company said all the firms involved have sufficient reserves to meet at least one year's worth of debt payments. "Fitch will monitor ongoing operations of each individual arena rating on case-by-case basis to determine potential impacts on the rating. The spectrum of potential rating actions will vary depending on financial flexibility and performance to the extent there is a significant reduction in regular season games," the company said.